Continuing our exploration of the Jewelry Arts, it’s time to actually make something pretty to wear or to give as a gift. What’s better than a new pair of pretties to wear? The knowledge that you made them yourself! This past weekend I got a chance to sit down at my work bench and make a couple of pairs of earrings using the mother of pearl disc beads I’d picked up in preparation for this art. ProTip: a piece of felt or fleece on your work surface keeps the beads from rolling all over the place. Granted, it does nothing when you open the box of beads upside down, no where near the felted surface–but you probably already knew that. These earrings use some basic wire skills, namely wrapped loops. If you’re not ready to tackle wire-work, the second earring project, below, just uses needle and thread. Begin by making a small loop with the needle-nose pliers on one end of the silver wire and bend the wire at a 90-degree angle at the end of the loop, creating a stop for the beads. This is a quick way to work around not needing headpins around for every project. Slide on your first bead (or bead group) and trim the wire off with a 1 inch tail measuring from the top of the bead (or bead group). For the little silver bells (of which you need 2 per earring), use a wrapped loop through the loop on the bell and leave a 1 inch tail of wire above. Begin the wrapped loops above each bead (group), making a 90-degree angle with the needle-nose pliers, then making a loop around the very tip of the round-nose pliers. Thread them onto the earring finding to test your arrangement. Now is the time to make any changes before completing the wrapped loops. Complete the wrapped loops for each of the 5 dangles and then repeat on the matching earring. You might wonder what’s the point of doing 5 drops when 2 of them will be hidden by the large mother of pearl disc? First of all, some people might see them from the side, and those empty holes just look accidental. Secondly, doing it this way keeps the earring balanced–to skip it would risk the earring hanging funny when worn. 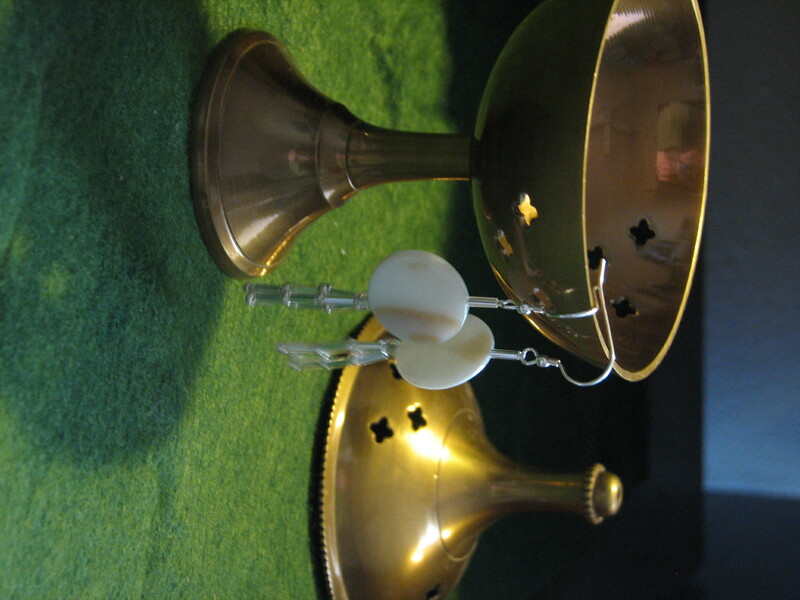 *After putting together the prototype first earring, I noticed the green glass beads were obscured by the silver bells. Adding the silver-toned seed beads lowered the green glass beads enough to looked balanced. It’s always a good idea to do a dry run. If you can thread a needle and tie a knot, you can make these earrings, that’s how simple these are but you’d never know it to look at them! Perfect for the upcoming beach-wear season, think how great these would look with a flowing sundress! Since I tend to be a visual crafter, I always layout my project before I sew or attach anything. It’s not a foolproof method by any means, but it works. Thread about 2 feet of beading thread onto the needle but do not knot it. Beginning with the last bugle bead on one tail, thread the needle through the bugle and the seed bead and then back through the bugle, leaving about 2 inches of the tail not pulled through. Tie 2 double knots just above the bugle bead to secure the thread, do not trim it yet. Thread the next seed and bugle bead set, working your way up the tail, onto the thread and tuck the loose tail into those beads. Trim the thread tail as close to the top of the second bugle bead as possible. Thread through the remaining seed and bugle bead for the first tail, through the central section (e-bead, disc and bugle) and loop through the earring finding. Go back through the central section and, this time, thread through the entire center tail. Skipping the last seed bead, thread all the way up to the finding loop and back through the central section. Repeat for the third tail, stopping above the e-bead on the way back up. Tie 2 or 3 knots above the e-bead and then go through the disc before trimming the tail between the disc and the top bugle bead. It sounds like a lot of back and forth, but once you get the hang of it, this sort of earring takes minutes to make and can be a very versatile pattern with just a change of focal bead and accents. We’ll have more tutorials to come, this month! Want to know how to do something in particular? Leave a request in the comments! That’s so cool! You have such a talent. I used to design jewelry when I was younger, but I could never do anything like this. So jealous about the Renn fair. I’ve always wanted to go! Renfaire.com is how we found the semi-local faire we just attended. Maybe there’s one in your area on the list? Have you ever tried to make your own glass beads? No–and there’s a really good reason for that! I’ve researched it, seen a live demo of the process and I learned very quickly that it’s not for me because it involves live fire. As a very accident prone person, I could totally see myself having a bead go awry and, in my need to fix it, reach into the flame (which the goggles/hood reduces the glare from) and cause serious injury to myself trying to catch or fix the molten glass. So I’m happy to buy lampwork beads from others who are more brave/careful than I and stick to making beads (when the mood strikes) from paper, clay or wool. You too! We’re staying home this weekend and doing around-the-house stuff. Do you have anything fun planned? Love the fresh design. I really enjoyed this article. Many thanks for this excellent post. After I saw your comment on my dumb blog, I had to see if there were rat terrier pictures, because I love me a rat terrier. But now I am SMITTEN by those earrings. SMIT.TEN. And yes. I just broke that work up with periods. I am annoying. Oh, no! Sorry to disappoint, but Abigail was many years ago re-homed to a nice Star Wars geek with a Beagle buddy for a playmate (read as: calming influence) when I was having too many health/schedule issues to give her the time and attention she deserved. Lamb meatballs are awesome. I’ve got to admit, the classic beef ones cooked in meat sauce are my favorite. Droolll…. And Happy Fat Tuesday to you! That is such a great tip about using felt to avoid mishaps. I’ll make a mental note of that. wow that looks gorgeous !!! Thank you, they were fun to make! Hey Scraps! These are beautiful! Casual and yet could be used to dress up an evening outfit! I need to get back into crafting and especially making my own clothes. Pingback: Scraps of Life–the 64 Arts » Blog Archive » Congratulations, June!